Art-C: Yakshagana....a popular & colourful form of dance theatre in Karnataka, India!!! 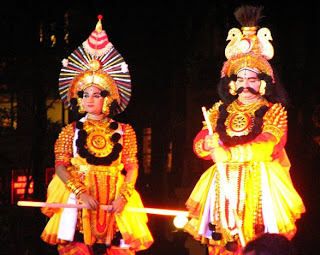 Yakshagana....a popular & colourful form of dance theatre in Karnataka, India!!! I recently witnessed the popular dance form 'Yakshagana' being performed at a cousin's wedding in Bangalore. 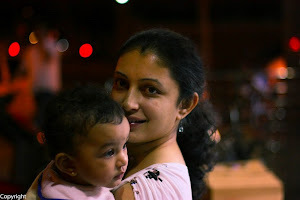 Although there were a lot of distractions during the marriage ceremony, the dance performance definitely had me riveted. This maybe because I was viewing it in a different setting rather than just as a stage performance. Yakshagana is a traditional & classical form of theatre combining dance, music, dialogues, costumes & stage techniques with a distinct style & is dynamic in essence. It is believed to have originated in the 13th century & is usually performed by the people of South India i.e Karnataka. It might also have evolved from pre-classical music and theatre. It can be compared to a large extent to the Western tradition of Opera & some even believe that the dance form Bharatnatyam originated from it. Yaksha-gana literally means the song (gana) of a Yaksha. Yakshas were an exotic tribe mentioned in the Sanskrit literature of ancient India. 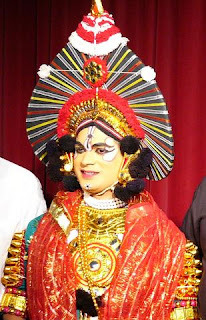 In a Yakshagana performance, actors wearing colourful costumes & makeup enact various roles especially depicting mythology i.e from the Hindu epics & puranas. It consists of a narrator (Baghawatha) who either narrates the story by singing or sings precomposed dialogues of a character, backed by musicians playing on traditional musical instruments as the actors dance to the music, with actions that portray the story as it is being narrated. The performances are such that there are large troupes of artists travelling through villages thus providing entertainment to the people & also managing to address them through social messages. This dance form is slowly gaining popularity & can even be found being practiced all over India & abroad. But no matter how much more I describe & speak about it, nothing can match the feeling one gets after having actually viewed a live performance......I can only term it as exhilarating!!! !